About Gahoi’s Pregnant Women And New Born Related Rituals, Worshiping And Customs! All rituals have started from the women’s 8th month pregnancy and lasting till 1 to 2 years old new born baby. The Gahoi Community has a rich heritage of traditions, culture, rituals and customs. Every ritual is justifiable with scientific reasons. 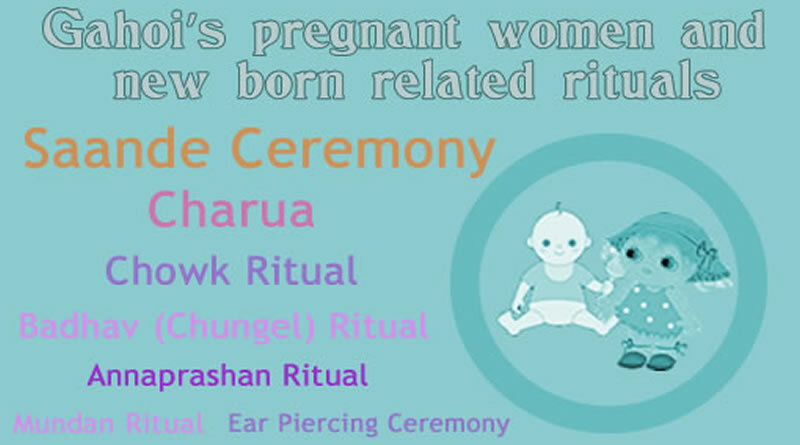 Gahoi Community has a lot of pre-birth and post birth rituals which have performed on pregnant women and new born baby. All rituals have started from the women’s 8th month pregnancy and lasting till 1 to 2 years old new born baby. There are a lot of interesting facts which are attached with these rituals. There are a few social and scientific justifications behind each and every rituals and customs from pregnant women to new born baby. Giving the child birth by a woman is just like new birth for her. The pregnancy is very difficult time for any woman. Her health and happiness during pregnancy periods of nine months is directly related to child’s health, progress and all around development in the womb of woman. So, Saande Ceremony has come in existence in Gahoi Community for fulfilling the need of pregnant woman’s happiness and health betterment during period of a few last months of pregnancy. It is very important that pregnant woman should be happy and content in every aspects of her life either physical desires or mental peace before delivery. It is also justified the scientific means. After completion of 7th month and beginning of 8th month of pregnancy, eldest women of Gahoi Community have performed Aanthawa ritual (Special attire for pregnant woman). During this ritual, pregnant woman has dressed in dark blue colour saree and bangles. An invitation has sent to pregnant woman’s parents for Saande Ceremony in the form of a coconut and sweets. The Saande Ceremony’s date has fixed during 9 months pregnancy. 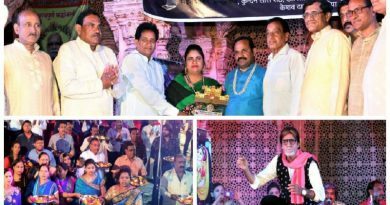 During this ritual, pregnant woman’s parents have gifted beautiful attires, gold and silver ornaments, tasty food items (Pulses, Rice, Bari, Bijore, Papad etc.) and sweets to their first time pregnant daughter and her family members as son in law, father in law, mother in law, sister in law etc. They do holy pray for pregnant daughter’s happiness, health and healthy baby birth. Pregnant woman’s sister in laws (Husband’s sisters) have also gifted pretty clothes and sweets to her Bhabhi (Brother’s wife). During this ritual, eldest women of community apply vermilion (Rori, sindoor, Kumkum) on forehead of pregnant woman and perform Aarti. They all pray for pregnant woman’s health and birth of health baby. After ritual, Pregnant Woman’s parents have left for their home after receiving gifts from Son in law’s family. After child birth, Child’s family invites relatives and other eldest women for the Charua Ritual. In this ritual, the first drinking water of medicinal leaves has to be given to women after child birth for body recovery from weakness. This medicinal water has given to women till one and half month. After Charua function, the astrologer makes the Kundali of new born baby. It is an important ritual for new born baby’s social life. After this, new born baby’s social life has started. 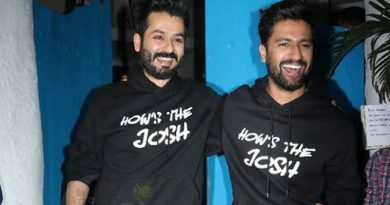 After seeing auspicious time, new born baby’s family invite all relatives specially baby’s maternal parents and uncle to attend the Chowk of new born baby. The baby’s maternal family (Nana, Nani, Mama, Mami) has invited by sending at least 5 jiggery (Gud) ladoos, 5 pede (Milk Sweet), Badi Durba (Big holy green grass), 1 Kg any sweet and Rs. 11. Same has to be done to invite Buaji (baby father’s sisiters ). The chow ritual has to be done as per your financial capacity. There is no need of any showiness. 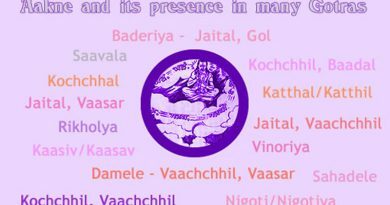 All members of baby’s maternal family try to attend the function and come with the gift of jaggery ladoos, sweet, clothes, items for new born (as kardhani (waist wearing of gold or silver), Payal (anklet), Pahunchi (hand wearing of gold or silver), Hai – Chandrama (sun and moon of gold or silver as necklace, golden chain, ring and toys), food grains (as Rice, Pulses, Papad, Bijore, Bari etc. ), small pillow and bed set and mosquito net. They also try to gift as clothes and gold or silver items to baby’s paternal family members as per the capacity. On this auspicious day, Purohit (Holy Man) performs chowk pooja and gives blessing to mother and new born baby. In this ritual, Bua (father’s sister) keeps saantiyan. New born baby’s mother performs a pooja (worship) on water giving resources as well or hand pump. After all this, the delicious food has served to all attendees. After this, the elder of family come with new born baby between the attendees for blessings to child. After ritual, baby’s paternal family has left for their home after receiving gifts from baby’s paternal family. This ritual has showed a special bond between brother and sister. It has performed by New Born’s Bua and Phoophaji (Bua’s husband). In this ritual, Bua has come at brother’s home with gifts of swing, toys, ornaments and clothes for new born baby, bhaiya, bhabhi. They come at home with little procession in the town with dance, songs and music. After this Chowk function, baby’s father has given gifts to his sister and family in his own financial capacity. Generally gifts should be more than what bua had come with. Generally, the bua has the first right of baby’s nomenclature. But nowadays, parents has decided name before child birth. After completion of new born baby’s first 6 months, the first tasty liquid food just likes Kheer (Milk and boiled rice mixture) has given to new born baby after seeing an auspicious time and day. After this, baby’s family tries to give different tasty liquid foods to new born baby for his growth and healthy life. It is very important ritual for child’s further growth and development. Generally, it has performed by new born baby’s maternal uncle and silver coin or spoon is used for feeding. Later, this silver item has gifted to baby. This ritual has performed within the 1 year age of new born baby. Generally this mundane or first hair removal custom should be performed at the family’s deity place. But nowadays, it has performed at any religious place or at the bank of any holy river in front of deity’s idol or picture. The Bua (sister of baby’s father) plays an important role during hair removal ritual. The Baby’s Bua makes Sata from the mixture of jiggery and wheat flour. The baby’s hair has to be taken in this Sata by Bua and has discharged in the holy river. The baby’s father gives gift to all sisters which are present there. As per old myth, the New Born Baby with birth hair should not be crossed any river. Before that the Mundan Ritual is very important. This is the very big ritual after Chowk Ritual just like marriage. It is performed in a big way. This is very important ritual for new born baby boy child. The Mai Mahar (Family Deity invited at home) has kept at home. All relatives are invited. On this occasion, there is need of a barber, a jeweler and a baari (a golden wire). The mother does ready her baby boy by bathing, applying ubtan (turmeric, oil and wheat flour mixture), clad in new clothes and red shoes. The child sits on the wooden item and the tilak is applied on his forehead. The barber removes all hair again (Big Mundan). After hair removal, a jeweler pierces the ear of child and inserts a Bari in it. Generally, baby boy wears only a Bari in an ear and baby girl wears Bari in both ears. The baby’s father gives money as a gift to a barber, a jeweler and other family members within the financial capacity after ritual completion. The baby boy also receives the gifts from all relatives on this occasion. 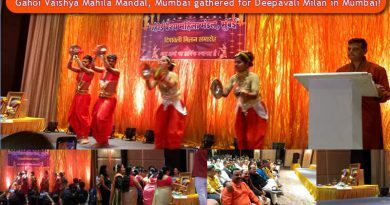 Nowadays, due to lack of time, the mai mehar pooja has not performed specially for mundan and ear piercing but it has performed on the wedding event of any family member. Overall, all the birth related rituals must be performed for the family and child welfare. It is also necessary for preserving traditional values of Gahoi Community in coming generation. If you need any help or suggestions regarding Gahoi or Gahoi Community related information, please leave your message at our Gahoi Help Centre. ← About Parenthood Or Parenting!